There have been some movers and shakers in the automotive industry lately not only in terms of innovation and design, but also in the dependability spectrum. Every year J.D. 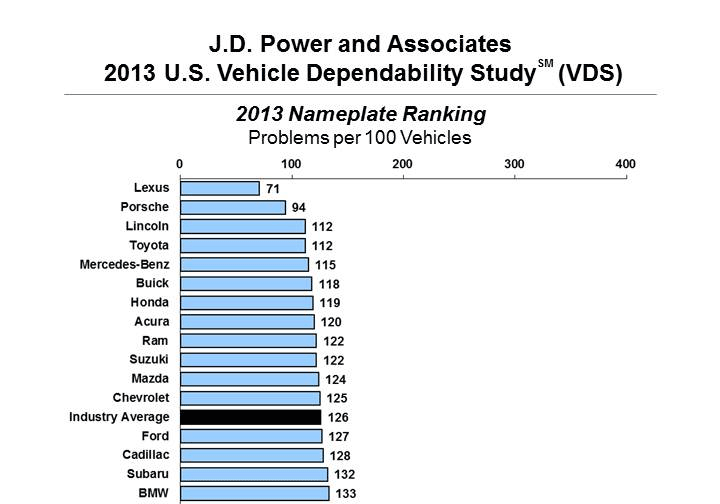 Power and Associates release a Vehicle Dependability Study (VDS) ranking problems per 100 vehicles for all makes and for a short list of individual models taking top spots for specific vehicle segments. Having a 2-year variance, the 2013 VDS report spills the data on 2010 model year vehicles represent the direction automakers are headed within the number of problems per 100 vehicles reported by consumers. For the 2013 VDS Lexus and Porsche continue to lead the way as they did in the previous year. Looking down the list you may take notice to some serious moves, one in particular being Ram moving up an astonishing 20 spots from the 2012 VDS report. Other notable changes include Infiniti, Mazda and Ford moving up the list from previous years. For individual models within their respective segments, Toyota takeing a majority stake with a top spot in 7 out of 18 vehicle segments. 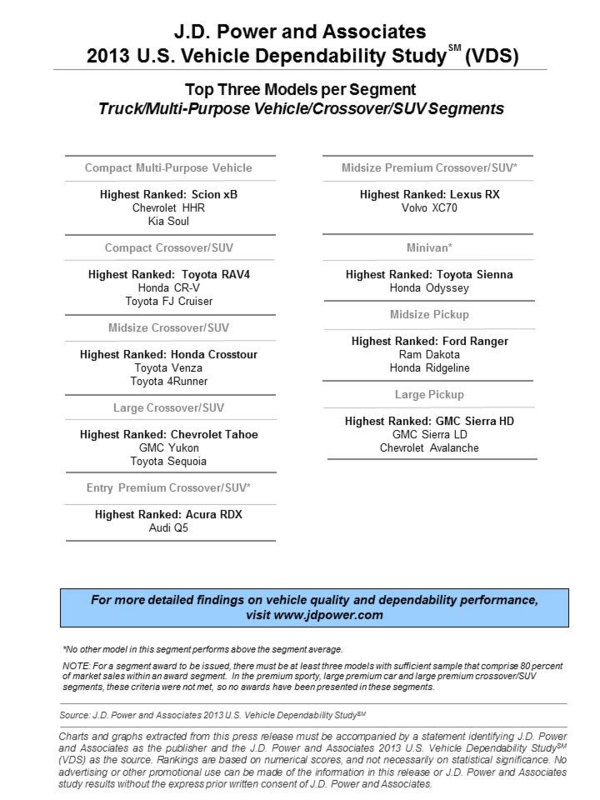 General Motors managed to capture top placement in four categories. We welcome you to visit the full breakdown and 2013 J.D. Power and Associates U.S. Vehicle Dependability Study in its entirety on the J.D. Power and Associates site. WESTLAKE VILLAGE, Calif.: 13 February 2013 — The long-term dependability of three-year-old models has improved year-over-year, according to the J.D. Power and Associates 2013 U.S. Vehicle Dependability StudySM (VDS) released today. The study, now in its 24th year, measures problems experienced during the past 12 months by original owners of three-year-old vehicles (those that were introduced for the 2010 model year). 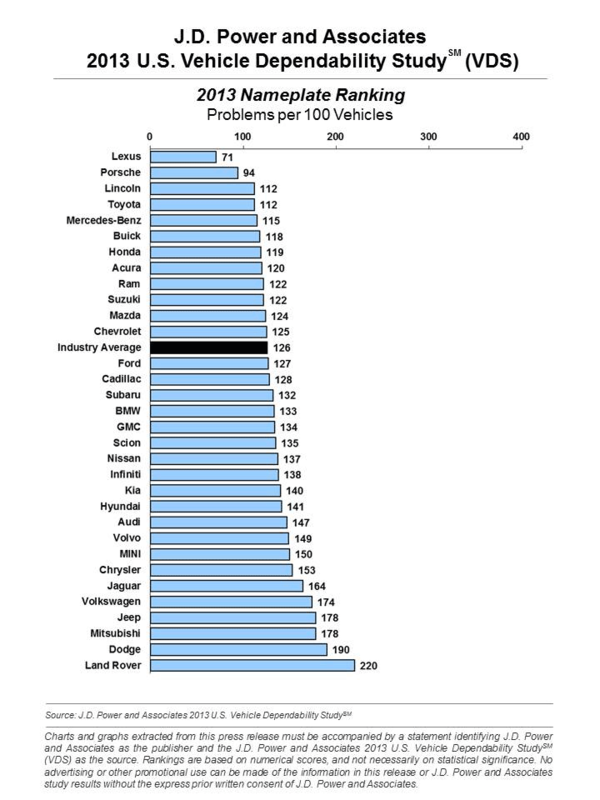 Overall dependability is determined by the number of problems experienced per 100 vehicles (PP100), with a lower score reflecting higher quality. -Vehicle dependability improves 5 percent year-over-year. -Domestic nameplates narrow the dependability gap with import nameplates to 10 PP100. -Toyota Motor Corporation models earn seven segment awards; General Motors garners four awards. In 2013, the dependability of models that were new or substantially redesigned for the 2010 model year averages 116 PP100, compared with 133 PP100 for models that were unchanged from the 2009 model-year–also referred to as carryover models. This is the first year that there are fewer reported problems for all-new or redesigned models than for carryover models since the study was redesigned in 2009. Models that were refreshed in 2010–those with generally minor changes to the interior or exterior–average 111 PP100 in the 2013 VDS. The study finds that the fewer problems owners experience with their vehicle, the greater their loyalty to the brand. Combining previous-year VDS results with actual vehicle trade-in data from the J.D. Power and Associates Power Information Network(R) (PIN), J.D. Power finds that 54 percent of owners who do not experience any problems with their vehicle stay with the same brand when they purchase their next new vehicle. Brand loyalty slips to just 41 percent, on average, when owners experience three or more problems with their vehicle. While owners of premium models are more loyal than owners of non-premium models, on average, the loyalty of premium model owners is more impacted by an increase in the number of problems experienced. For example, 55 percent of owners of premium models remain loyal to the brand when they report zero problems with their vehicle, compared with 53 percent of owners of non-premium models who report zero problems. Loyalty begins to decline as soon as the owner experiences any problems with their vehicle. When experiencing three or more problems with their vehicle, loyalty among owners of premium models declines to 39 percent and 41 percent among owners of non-premium models. Lexus ranks highest in vehicle dependability among all nameplates for a second consecutive year. Among models, the Lexus RX has the fewest reported problems in the industry at just 57 PP100. This is the first time in the history of the VDS that a crossover or SUV has achieved this distinction. Rounding out the five highest-ranked nameplates are Porsche, Lincoln, Toyota and Mercedes-Benz. Chrysler Group LLC’s Ram brand posts the greatest year-over-year improvement from 2012–by 52 PP100. 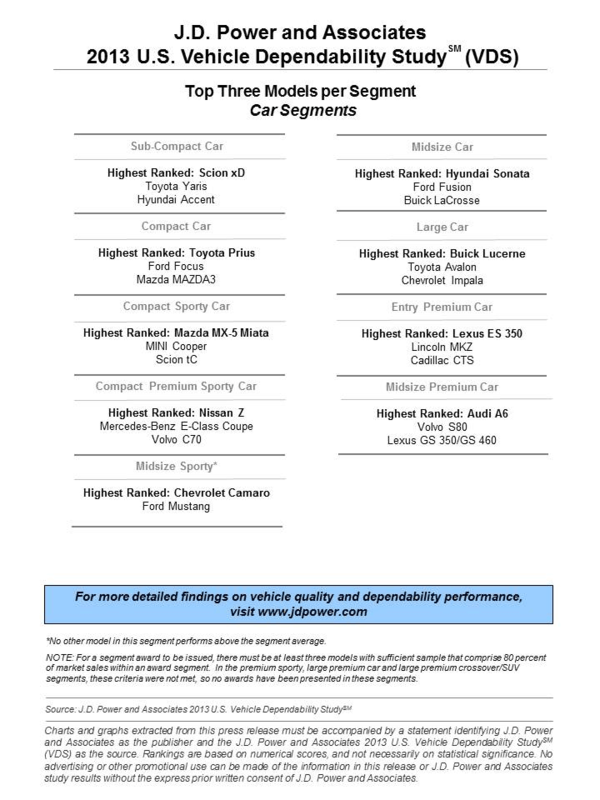 Toyota Motor Corporation continues to perform well in long-term dependability and earns seven segment awards–more than any other automaker in 2013–for the Lexus ES 350; Lexus RX; Scion xB; Scion xD; Toyota Prius; Toyota Sienna; and Toyota RAV4. General Motors receives four segment awards for the Buick Lucerne; Chevrolet Camaro; Chevrolet Tahoe; and GMC Sierra HD. American Honda Motor Corp., Inc., receives two model-level awards for the Acura RDX and Honda Crosstour. The Audi A6, Ford Ranger, Hyundai Sonata, Mazda MX-5 Miata, and Nissan Z also receive segment awards. The perception that all-new or redesigned models can’t be as dependable as those that have been on the market for a year or more is not accurate. Just because a model is new to the market or has been recently redesigned doesn’t necessarily mean it won’t be as reliable. In fact, dependability of all-new and redesigned models is at a record high, according to 2013 VDS data. Dependability of three-year-old models is at an all-time high. If you can’t afford a new vehicle, or simply don’t want one, you should feel confident when buying a certified pre-owned (CPO) vehicle. Whether buying a CPO vehicle or not, be sure to check quality, appeal and dependability ratings of models you are considering on jdpower.com. Improvements in vehicle dependability have been made by both domestic and import brands, and the gap between the two is narrowing. Perceptions of dependability should not be based purely on vehicle origin–consumers should research a variety of sources in order to make a decision consistent with the current reality of the market. The Vehicle Dependability Study is used extensively by vehicle manufacturers worldwide to help design and build higher-quality models, which typically translates to higher resale values and higher customer loyalty. It also helps consumers make more informed choices for both new- and used-vehicle purchases. The McGraw-Hill Companies (NYSE: MHP), a financial intelligence and education company, signed an agreement to sell its McGraw-Hill Education business to investment funds affiliated with Apollo Global Management, LLC in November 2012. Following the sale closing, expected in early 2013, the Company will be renamed McGraw Hill Financial (subject to shareholder approval) and will be a powerhouse in benchmarks, content and analytics for the global capital and commodity markets. The Company’s leading brands will include: Standard & Poor’s, S&P Capital IQ, S&P Dow Jones Indices, Platts, Crisil, J.D. Power and Associates, McGraw-Hill Construction and Aviation Week. The Company will have approximately 17,000 employees in more than 30 countries.